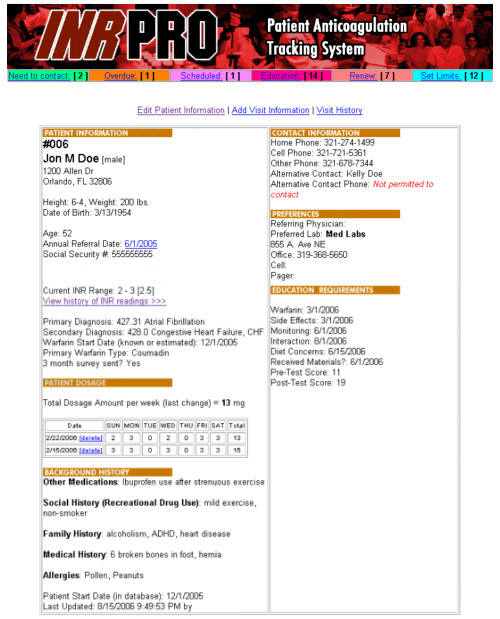 The password-protected, secure web-based system contains all basic health information, including medical facility and patient searches, patient contact information, preferred labs and physicians, dose change history, detailed visit and test result information, patient medications/interactions, and patient medical and family history. You can also keep track of the addresses and contact information for local physicians, labs and pharmacies, and patients, so you can quickly contact them, or track which ones are being used by your patients (download mailing lists to Excel or Word program). 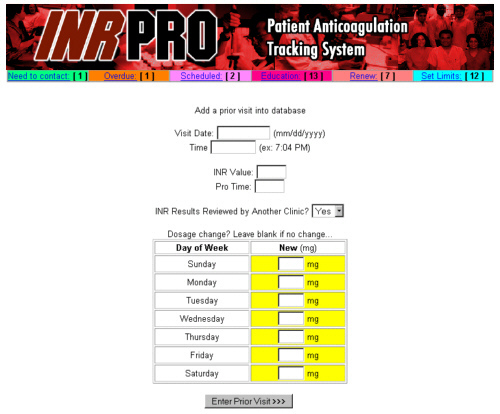 INR Pro© also allows you to enter historical INR and protime results for each patient, so you can make the proper data-driven decisions. 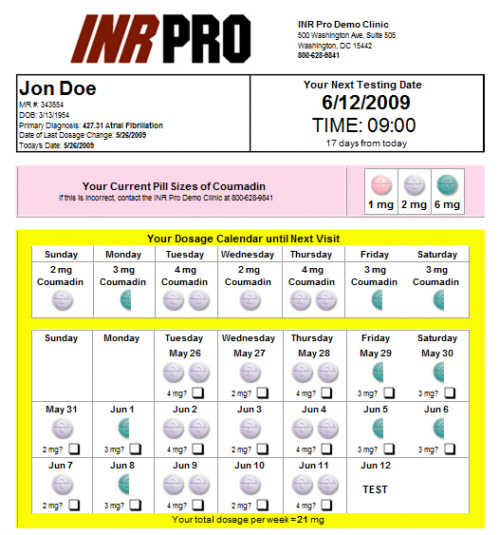 You can also print off a copy of the dosage change and give to each patient, so they don't forget! 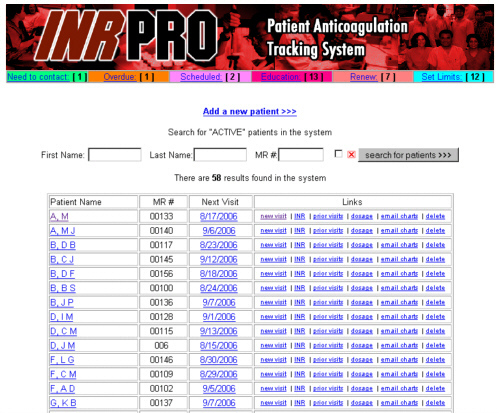 CoumaCareSM users: You can now convert to INR Pro© without any extra setup charges! No downtime! New features, process management and expanded reporting! Read about our conversion process >>>. 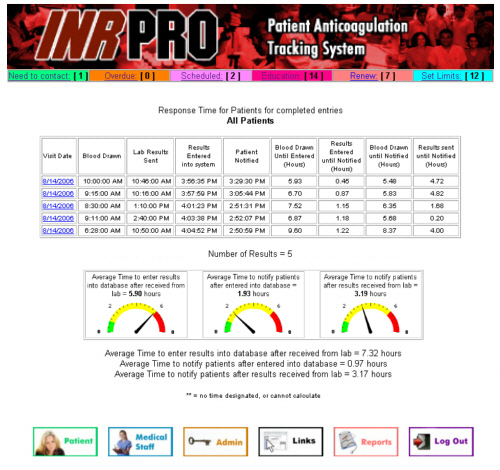 Two new features have been added to INR Pro©, bridging therapy tracking with calendar printout feature, and Bleeding Risk Index calculations. More info coming soon! 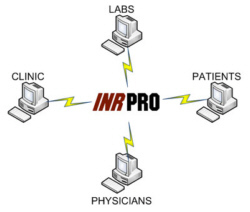 INR Pro© was developed through an AHRQ grant, focused on improving the number of readmissions related to warfarin patients. This system was a key aspect of the improvements implemented in the grant. 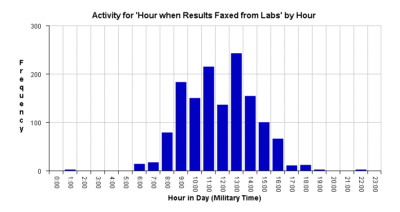 By viewing a chart and histogram of a patient's INR values using Statistical Process Control (SPC), the analyst is able to determine whether the patient's readings are significantly higher/lower than historical results, and compare them to the expected therapeutic range. This helps prevent unnecessary dose changes to the patient. 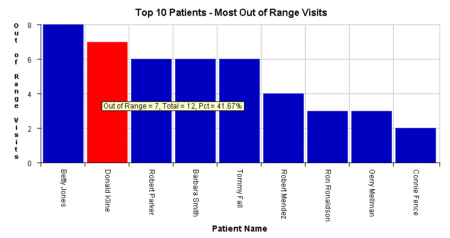 Not every patient has the same needs, and the Patient Priority report provides you with a "Top 10" list of patients with the most Out of Range visits within a specified date range, so you can work closely with them first, without trying to provide additional education to all patients (some may not even need it). Another lean concept is visual controls, to quickly identify what the status of the process is at a given point in time. 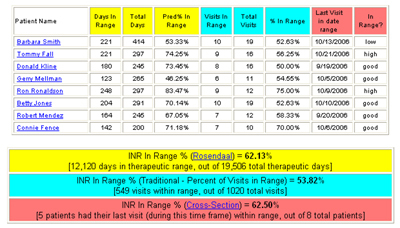 In late 2013, we added a dashboard view, to show how many are within their INR range, how many INRs are scheduled each day, the completion/response time averages for the visits each day, and a summary of which hour the patients are being seen. The perfect snapshot view for a manager or clinic director to check on progress. 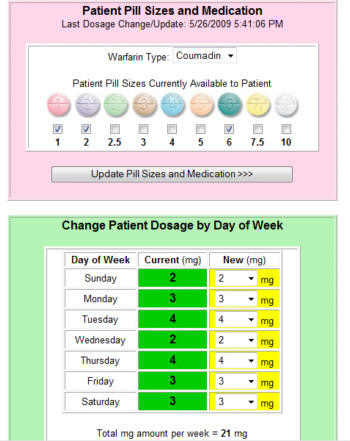 The system has 4 different access options for those involved in the Warfarin management process. Scientific Evidence - Why use these charting techniques? "Despite the finding that the INR is a weak predictor of hemorrhage overall, small INR increases within the therapeutic range may be the only sign of impending hemorrhage. The bleeding may occur quite rapidly, within a few days of a rise in INR to the upper limit of normal." 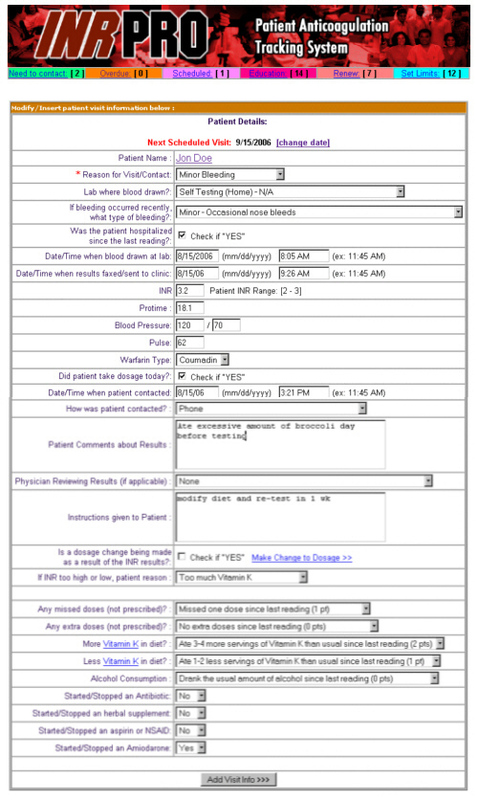 Statistical Process Control (SPC), in conjunction with trend analysis techniques (Western Electric Rules or Nelson Rules) can identify slight drifts and trends in the INR results (out of control conditions), which can prevent the onset of complications, such as hemorrhage and bleeding in certain patients. 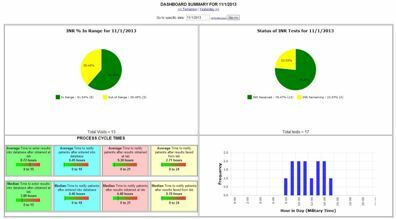 SPC is a key tool within Six Sigma. Six Sigma is a performance improvement system that utilizes data and statistical analysis to measure and improve operational performance and practices. The development of INR Pro© utilized Six Sigma techniques and methodology. An AHRQ paper will be published in 2008 to summarize the development of this system, and the use of Six Sigma to improve anticoagulation management. In addition, the American College of Chest Physicians (ACCP) recently conducted a study to show the benefits of a Six Sigma initiative to improve patient care. To learn more about how you can get help with Lean and Six Sigma, visit our consulting page. 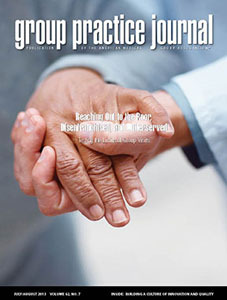 Customization - Need something customized for your clinic or business needs? We realize one size does not fit all, so we will be glad to talk to you about how your needs can be addressed with a modification to our system. Don't develop something from scratch. We probably have a large portion of your needs already implemented on another customized version of the system. Contact us with questions or changes you would need, and we can provide a quote within a few days.